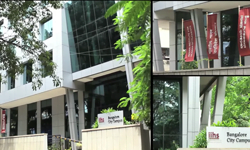 The proposed IIHS IOE main campus is located on a 54-acre freehold site at Kengeri, Bengaluru. The digitally-augmented buildings and facilities slated to be built over three phases, are expected to enable interdisciplinary teaching-learning, research and practice, and demonstrate the best examples of Indian design and traditional crafts. a convention centre to host 1,500 people, a separate city museum, and multiple performance and exhibition spaces. The campus of the proposed IIHS IOE will aim to provide students and researchers the opportunity to immerse themselves and innovate around India’s core urban challenges. A series of site surveys and ecological studies including hydrogeological and land use pattern studies, and biodiversity and topography surveys, were conducted to form the basis for the design of the proposed IIHS IOE campus. By designing for local ecological functions, the campus of the proposed IIHS IOE aims to provide not only important ecosystem and sociological services to its larger academic community but more importantly to its immediate surrounding locality. The campus aims to ensure the mitigation of land, water and air pollution, provide energy-efficient and environment friendly movement of people and goods; optimise productive and ecologically diverse usage of open spaces; augment the use of both local and reusable or recyclable materials; and safeguard the wellbeing, convenience and efficiency of its inhabitants. IIHS will also seek to ensure that the community of workers that constructs its buildings are fairly paid and well-housed, and that work practices followed comply with prescribed guidelines and regulations. IIHS currently functions out of a 21,000 sq ft City Campus spanning four floors and an expansive terrace with a roof garden that serves as an ideal open learning environment. ‘Tharangavana’, located in a one-acre area of rare plants and trees overlooking the Sankey Tank in Sadashivanagar, is a heritage building and an extension to the IIHS City Campus. It serves as an ideal location to house guests, visitors and staff members; to conduct seminars and discussions; and to provide space for quiet reflection for scholars, practitioners and policy makers. The 3,500 sq.ft IIHS Chennai office is strategically located at T Nagar. With 25 workstations, a library, cafeteria and a meeting room/classroom, the space is designed for teaching and research, and to conduct workshops and training programmes. The 3,000 sq.ft IIHS Delhi office is strategically located at Kasturba Gandhi Marg Connaught Place across three different floors in the Surya Kiran Complex. It is used for teaching and research, and to conduct workshops and training programmes. With 30 workstations, a library, meeting rooms and a classroom enabled with audio-visual facilities, the space is ideal to host talks, masterclasses, film screenings, seminars and workshops. The library has a collection of 1500 books. 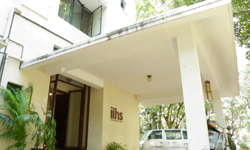 The IIHS Mumbai office is a Business Centre on Napean Sea Road, mainly used for the purpose of meetings and discussions.